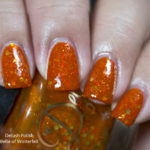 Delush Polish Girl of Many Faces is also part of the Dames of Thrones collection. Described on the site as “A deep chocolate jelly, accented with sparks of microfine glitters that will have you stand out no matter how much you try to blend in.“, it’s definitely true of the character that inspired this polish, Arya Stark. As a side note, did you finally catch Game of Thrones’ season finale? I’m a bit worried about Arya…she was once so caring and feisty. Now she’s a murderer who killed with a serene smile on her face. I like how they’ve built up her character. Anyway, I really like Delush Polish Girl of Many Faces because it’s a brown that actually doesn’t make my skin look ruddy or muddy. The glitter practically dances in the base. There is a small smattering of red glitter that stands out because it’s neither gold nor the base color of the polish. 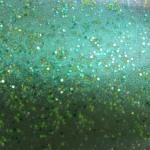 It winks at you and makes you want to find more of it within the polish. Come and have a look and let me know what you think? As always, click on the thumbnail to bring you to the original full size image. Now that you’ve seen it, do you want to have it in your collection? Oh wow, that is such a gorgeous and unique color. 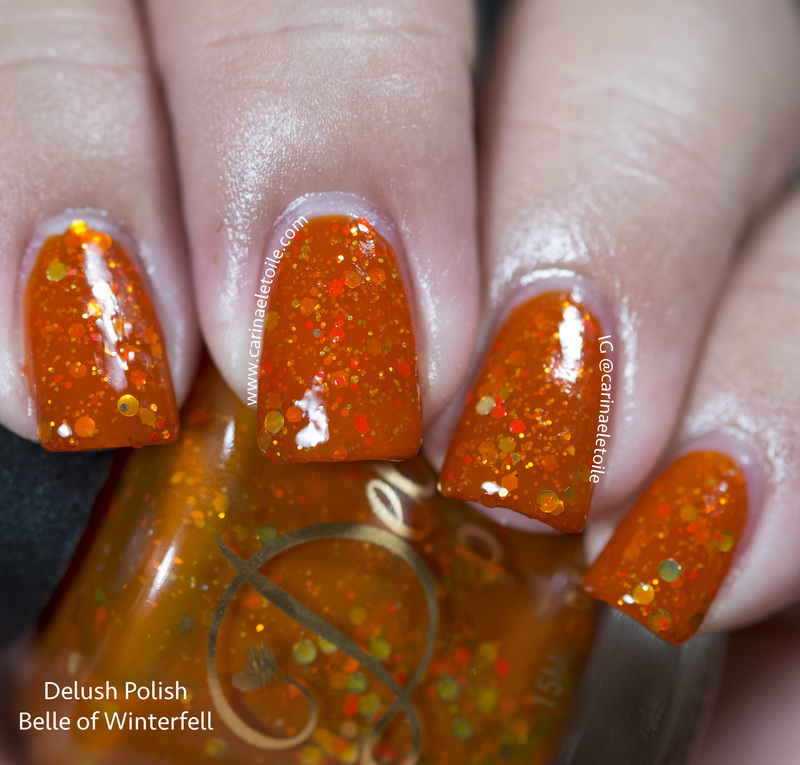 I don’t watch Game of Thrones (and have only read the first book) but this is pretty stunning polish. 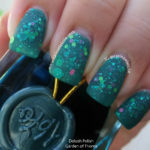 Love the colors– I really like that base is dark but not actually black and the glitters really pop against it instead of being swallowed by it. Lovely swatches! I love brown on the nails and the glossy swatch is soo gorgeous!